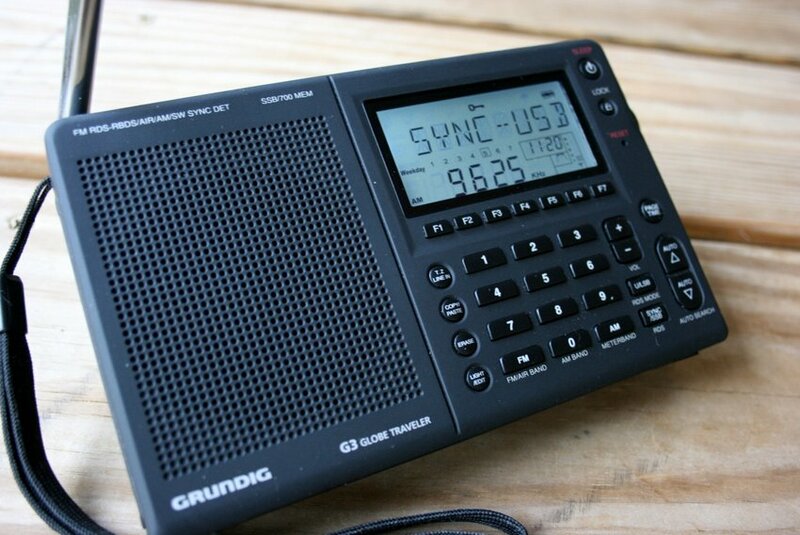 It’s hard for me to believe that it’s been over three years since I published my first review of the Grundig G3 shortwave radio. My initial impressions were mostly positive, and since then, the G3 has become a staple in North America and a fixture in my radio collection. I bought one of the very first G3s in production in the summer of 2009, and about a year ago, I replaced it with a current model. So, what do I think of it now? After having two different production-run models and traveling with my G3s for over three years? I have to admit, I continue to love this radio. In fact, if you write me an email inquiring about a good portable shortwave radio in the $100 price range, you can bet that I will still recommend the G3. The G3’s biggest competitors (roughly in the same price range) are the Sony ICF-SW7600GR and the Tecsun PL-660. I may very well review them all side-by-side in a portable showdown in the near future–but until then, it’s worth noting that the G3 is the least expensive in this crowd, and is simply an excellent performer for the price. So I just can’t hesitate to recommend it. Why do I like the G3? Adaptive tuning wheel–mounted on the right side–keeps speed with your thumb; it’s a band-scanning demon! Not to mention, all that I mention in my first impressions post! Simply put, the G3 functions as a portable shortwave radio should. It’s easy to tune, great to listen to, it functions well, has SSB and line out, has an external antenna jack, has two well-apportioned filters (wide/narrow), and still manages to be relatively inexpensive. Perfect? Well…almost. Though I never use the Air band, and I rarely use the MW (medium wave) band (mainly for DXing), many reviewers and critics of the G3 point to less-than-stellar performance in these areas. I’ll admit, the Air band is a nice add-on, but is certainly no reason to buy the G3. I find MW listening quite pleasant and I’ve certainly heard a little DX on it, but it probably doesn’t compare to some of the well-known ultralight radios which handle the MW amazingly well. And a couple of years ago, some reviewers complained of quality problems; I assume these were associated with specific production runs. As I’ve had two radios from two different production runs and have never experienced a quality-control issue, I must have been luckier in obtaining solidly-produced units. Perhaps it was my recent review of the Degen DE1129 that made me realize that many of the newer, smaller portables add features, but toss out many of the basics I expect from a shortwave radio. In other words, the things that make a radio pleasant to use, like ergonomics, performance, and an intuitive design. The G3 has these in trumps. 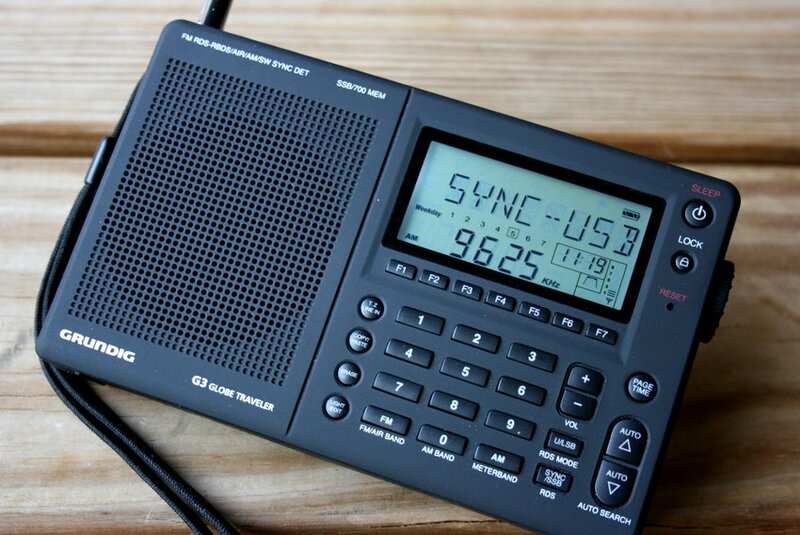 So, if you’re sitting on the fence about a $100 shortwave radio, I would snag the G3. I did–and haven’t looked back. This entry was posted in Reviews and tagged G3, Grundig, Grundig G3, Grundig G3 Comparison Sony ICF-SW7600GR, Grundig G3 Review, Sony ICF-SW7600GR, Tecsun PL-660 on September 25, 2012 by Thomas. I stumbled upon one of these at a local Radio Shack last night and bought it for the clearance price of $39.95…only downside is that I turned it over to my wife to give me for Christmas. I’m sure I can’t go wrong at that price. Pardon my second comment. But I meant to ask. Can any of you say which has better sound quality for long term listening? Some have slammed the Sony as being ‘tinny’. But I’m not so sure I believe them. This is a difficult and common comparison. I have both radios and use them for different reasons. I do love the quality of the Sony–I believe it will last for many years and will become a classic. The G3, though, has better audio from its internal speaker. It also has a tuning knob. Performance-wise, I think the Sony may have a slight edge on the G3, especially in terms of sync detection. Neck and neck, in so many respects, though. On MW/SW, it’s a matter of taste. As an older radio, I like the wide settings on the Sony. I wouldn’t call FM tinny (unless you were listening to an over-processed Top 40 station, but the Grundig is far superior in sound. I’ll give a personal half-nod to the analog volume, but mine is a little scratchy. I think the Japanese will not make any other radio. Trust me, the sony 7600 will be the best. The Sony 7600, is a work of Japanese art, soon it will be remembered as the best radio ever made, the radio that you can pass on to your children, Eton G3 is a technologically superior radio but its Chinese background are a point against. There is no doubt the 7600GR is a beautiful radio and work of art. I still use mine. However, it is older technology which, in some ways, may or may not be a good thing. As I mentioned elsewhere, I like the Sony on MW and SSB. Solid performer, no interference from a smaller digital display, slightly wider bandwidth and simple ergonomics. However, the G3 will receive stations the Sony will not, utilizes DSP for vastly superior FM selectivity and provides much, much more in terms of features and functionality. The radio will do things the Sony will not. Scanning on the Sony is a chore and I have to push a button to view the time. In 1998, it was the best of the best and although quality never gets old, technology does. I own both the G3 and it’s earlier sibling, the G5 and both are better radios. Doesn’t matter their country of origin with the possible exception of quality control, and Tecsun/Degen/Grundig have been aggressively addressing that. I actually asked Universal Radio their advice today on active antennas–in case they had anything to suggest–and found that their thoughts coincided with mine. In general, I’m not a fan of active antennas. They can have two undesirable results: 1) Front-end overload and 2.) they often amplify local RF noises more than the target signal. The only active antenna I’ve had any success with was the Sony AN-LP1, which is no longer manufactured. When I’ve enjoyed success, it was not in a hotel room, or at home (what it was really designed for), but in relatively RF quiet environments, like the off-grid cabin where I spent my vacation this summer. Even then, though, I found a long wire to be more effective most of the time. With Grundig radios, I’ve had best results with reel type roll-up wire antennas like the Sangean ANT-60 (http://www.universal-radio.com/catalog/sw_ant/3184.html). Not only are they handy, but they’re simple and not so long as to overload a radio’s front end. Especially with the G5 and G3, I would not add too long of a long wire as an external antenna–sometimes even static from too long of a wire can damage the receiver. The roll-up antenna length is ideal, in my opinion. I hope others chime in and comment here, but that’s my two cents. Based on your recommendation I ordered a G3 from Universal Radio (together with the Mini 400 inc. for free) and expect arrival shortly. I would appreciate your advice for a good active antenna (hopefully with the ability not to overpower G3’s input) to be used indoors in a two story townhouse built with a wooden structure and typical siding in the northern suburbs of Chicago. My initial listening interest is in the 3173 – 9780 range from low power stations. The price of G3 is very comparable to the PL-660. Can you compare the two in terms of raw AM/FM/SW performance? Thanks for that tip, Chris! The sync is easily adjusted by turning a small potentiometer. I posted a write-up of how to do it on the G3 Yahoo group, and it was expended on by others.